NOTE: The images accompanying this review are promotional stills that do not represent the quality of the Blu-ray under review. 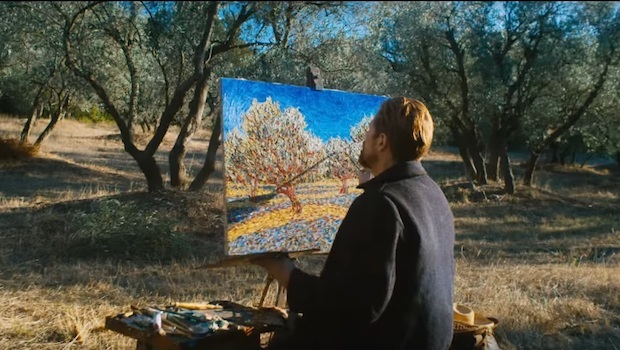 Vincent Van Gogh has proved perpetually interesting to filmmakers, if only because the broad strokes of his life story illustrate the torment and the triumph of the unappreciated artist. What creative person doesn't feel like an outcast pushed to the brink, if only now and again? 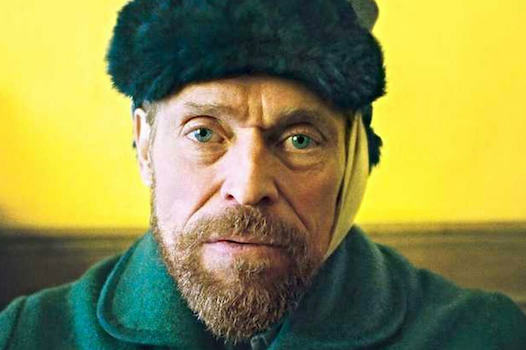 Visual artist-turned-filmmaker Julian Schnabel specializes in off-kilter biography (The Diving Bell and the Butterfly, Before Night Falls), and his take on Van Gogh's last few years, At Eternity's Gate, tries vigorously to avoid cliché. Unfortunately, apart from some strong performances and stand-alone sequences, the film is overwrought and overthought. It too often obscures the man at its center. It might seem odd to cast Willem Dafoe as Van Gogh, seeing as he is currently a few decades older than the artist when he died at 37, but Dafoe feels the part as much as he looks it. I'm not the first to mention it, but there's much of Dafoe's Jesus from The Last Temptation of Christ in his Van Gogh. His version of Vincent is full of spiritual yearning, brought to ecstasy by what he finds in nature but brutalized by other people. When others intrude upon Vincent's solitude, the film gains focus and purpose. Rupert Friend only has a few brief scenes as Vincent's brother Theo, but he and Dafoe share a warmth and intimacy that quickly illuminates their relationship. Mads Mikkelsen and The Diving Bell's Mathieu Amalric both enrich scenes in which they essentially act as interrogators of Vincent. Mikkelsen is a priest at the asylum where Vincent goes after he cuts his ear; he despises Vincent's art but is honest in his concern for Vincent's well-being. Amalric is Dr. Paul Gachet, who offers Vincent a place to recuperate after his time in the asylum (a time previously dramatized in Maurice Pialat's 1991 Van Gogh film) and tries to unpack some of Vincent's crowded headspace. The main intruder, however, is sadly the least effective. I'm typically a fan of Oscar Isaac, but his Paul Gauguin is written as a thankless buddy role -- and Isaac does little to elevate it. Apart his real-life relationship with Van Gogh, Gauguin serves a purpose in this film, by pushing his friend through certain artistic boundaries while simultaneously illustrating that even one's closest friends might be prone to misunderstand and naysay. But that's all Gauguin does. He's a device, with little perceptible inner life of his own. 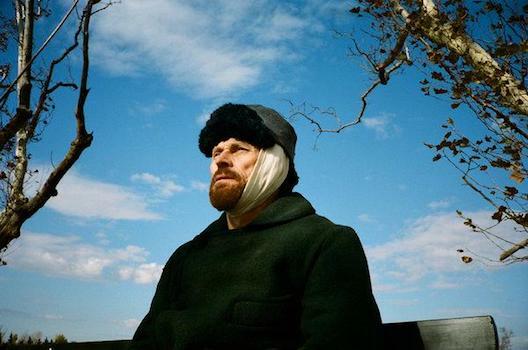 There's much to like within At Eternity's Gate, but the filmmakers' self-conscious attempt to find fresh takes on well-trod material is too mannered to be fully satisfying. For my money, the smaller scale and slice-of-life style of the previously mentioned Pialat film offers a more compelling portrait of the artist. At Eternity's Gate comes packaged with a Digital HD code. No complaints from this AVC-encoded 1080p 2.35:1 transfer, which features a high bitrate that satisfyingly copes with cinematographer Benoît Delhomme's antsy handheld camerawork. Colors range from drab to supersaturated, as the story demands. No noticeable bleed or noise. Image is sharp, except for some intentionally blurry POV shots. The main DTS-HD MA 5.1 surround track is suitably immersive without being over-the-top. No damage or distortion. A lossy English Descriptive Audio is also provided, along with three subtitle options: English, English SDH, Spanish. Audio commentary by director/co-writer/co-editor Julian Schnabel and co-writer/co-editor Louise Kugelberg - Some quiet patches, but overall a laidback and informative discussion between the collaborators about the writing, shooting, and cutting of the film. Featurettes (HD, 7:02 total) - Lionsgate's in-house EPK style is slick and quick, and these three clips (under 3 minutes each) are no different. Some interesting glimpses of work on-set, and plenty of soundbites, but no depth. At Eternity's Gate boasts some excellent performances, not just from Oscar nominee Willem Dafoe, but also from the briefly spotted Rupert Friend, Mads Mikkelsen, and Mathieu Amalric. Unfortunately, the film's style is too self-consciously fractured to fully deliver. Rent It.